The Syrian TV show Abu Janti (المسلسل السوري ابو جانتي) is one of the best Arabic shows I've seen. It's a comedy show mainly, but it's got drama too. 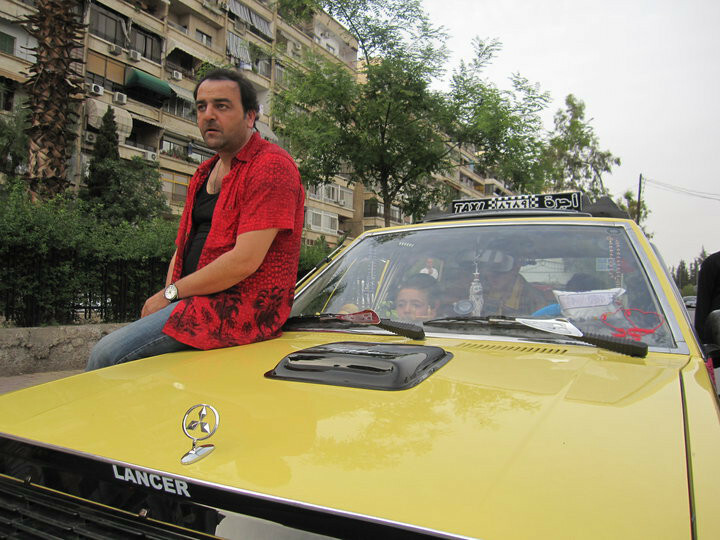 The show centers around the life of a taxi driver named Abu Janti, his mother and sister, and his friends. 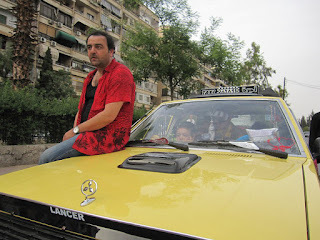 A lot of the show is shot from inside his taxi as he picks up odd characters around Damascus. For me, his interaction with them is the best part of the show. I also love that since Abu Janti is driving around Damascus you really get to see the city, its streets, buildings, and people. The show isn't restricted to the inside of building and you get to see a place that you've never been. One thing that's invaluable about this show from the standpoint of someone trying to master the Arabic language is that the language spoken in the show is really authentic. It's much more like how real people talk than dubbed soap operas. If you can understand everything in this show then you have done it. You can say that you are a master of at least the Syrian Arabic dialect. I'll admit that I don't understand everything that's said, but that tells me that I'm watching the right show. In dubbed soap operas the language is much simpler and a lot less slang and colorful language is used. They're good for starting out because everything is very clear, but even if you can understand every word in them there is a lot that they won't expose you to. On the topic of not understanding everything, often the most difficult to understand people are the ones who are not very educated. In this show there is a friend of Abu Janti named Abu Layla (ابو ليلة) who represents that type of person. The actor wears fake teeth on top that jut out and make it hard to understand him. He also doesn't move his lips much when he talks. He's supposed to be a village idiot character, but there are so many characters like that in this show which is what makes it so fun to watch. Abu Layla has a pretty wife somehow and it's hard to believe that a marriage between 2 people who are so different would happen in real life. Abu Layla isn't satisfied with his wife though because she bosses him around all the time. I guess that's why he's always hitting on every pretty girl that walks infront of his button shop. Most of the time you see him he's forcing his one employee, Waleed (وليد), to transcribe the songs he thinks up to woo women. The two characters that I don't really enjoy are Sa'eed (سعيد) and Su'aad (سعاد). Sa'eed is approximately 35 to 40 years old and he spends all his time trying to become a good enough soccer goalie to actually be allowed to play in a game. His girlfriend Su'aad is played by an actress who has been in a lot of popular Syrian shows including Dunya (دنيا) and Bab al Hara (باب الحارة), but I really just find the two of them annoying. Su'aad's personality is very abrasive and I never really cared about Sa'eed's plight. The rest of the characters are much more interesting. Abu Janti's sister Awatif (عواطف) is really cute and naive and wears her emotions on her sleeve. The love story between her and Abu Layla's employee Waleed is fun to watch unfold. Then there's Imad (عماد) who works as a painter and lies to a girl who he sees from the balcony that he owns the place he's painting. He strings a bunch of lies over many episodes to make himself seem like he's rich and important so that she likes him. I would recommend this series to anyone wants to watch something in Arabic but finds most shows boring. The show isn't overly conservative which allows it to present more interesting scenarios than some other shows. The Arabic in the show will be extremely hard to understand at first, but give it time. You're learning even when you don't think you are. You can watch the show at panet.co.il. I honestly think بقعة ضوء is better than this series. Abu Janti is alright but I kinda find it lame. While بقعة ضوء is fun & I've really learned from it. Looks good. It's interesting to see how often they use ليك ("lek"). I was also surprised to hear them use كرمال ("kirmal") which I thought was used only in lebanon. Yeah! Hopefully there will be a season 2 where he gets his own car! I really love that show. It's probably my favorite Arabic TV show. What's the right way to say Qatar?